Former chief of staff says he intends to avoid a binational state but will ensure that no Jew is uprooted from Judea and Samaria. Former IDF chief of staff Moshe Ya’alon, who is running for the Knesset as part of the Blue and White list, told Israel Hayom and i24NEWS on Sunday night that he intends to avoid a binational state at all costs but will ensure that not a single Jew is uprooted from Judea and Samaria. “We are in the middle,” he said, appearing to oppose both a one-state and a two-state solution. At the same time and above everything else, he said that any political arrangement would ensure that “not a single Jew was uprooted” from communities in Judea and Samaria. 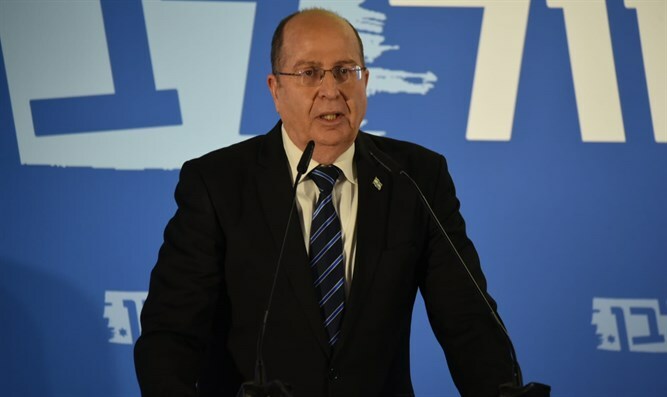 “Israel can manage with very big sticks and carrots,” Ya’alon told the i24NEWS-Israel Hayom election special, implying a maintenance of the status quo with Israel’s security interests at its very core. “I am considered hawkish when it comes to security but I do care about the Jewish and democratic values of the country so I believe we can create a coalition from the rational right to the Zionist left,” Ya’alon said.